I hope you have had a wonderful week. I want to thank everyone for the prayers, well wishes and sweet comments about my fun little dental saga! It really hasn't been bad at all (although I could have done without hearing that drill right next to my ear)! I have a couple of stitches and will have to be careful of those for the next 2 weeks. I'm also still a bit sore and swollen, but nothing a couple of Advil won't handle! According to the Doc, the next phase is all "mechanical"....no drilling, no cutting, no stitches...yay! But, that's still a couple of months away....so, I'm just not gonna think about it right now! How about those shoes? This girl has style! 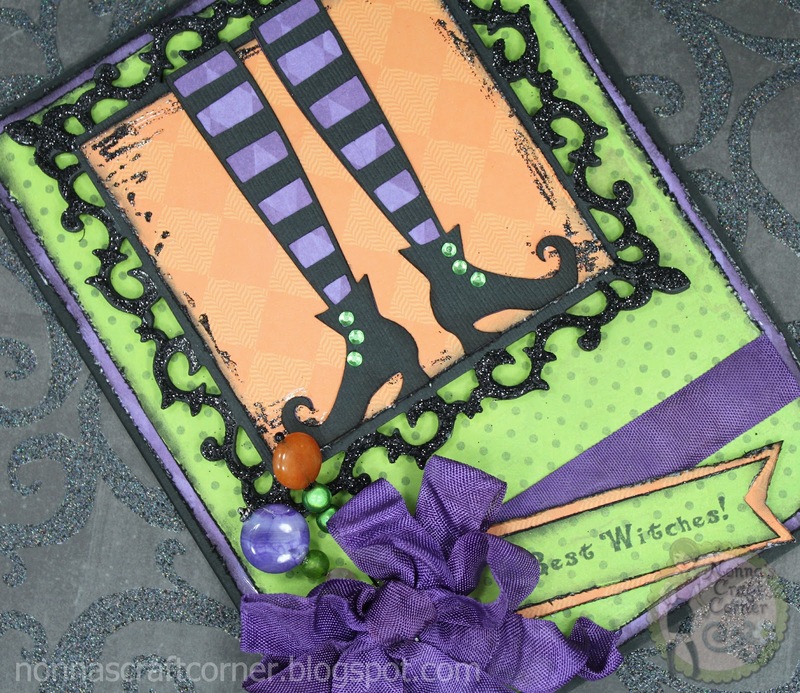 * The gorgeous, yet somewhat spooky mat is from Spellbinders - "Fleur de Lis Squares"
* I cut the mat out twice and used pop dots between the layers. The top layer got a bit of Glossy Accents and Martha Stewart "Onyx" glitter around the edges and I sort of "dribbled" some over onto the orange mat for a messy...er....shabby chic sort of look! 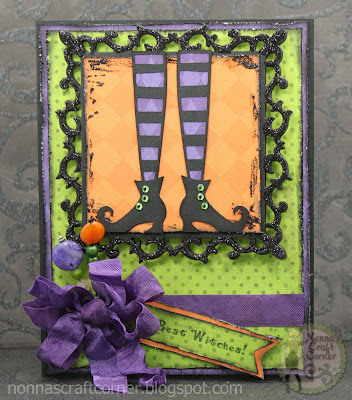 * Those fun, witchy legs are from the Silhouette Online Store. * Fabulous dark purple ribbon is from "My Craft Spot"
* Stick pins were made by yours truly! * Sentiment by "Pink By Design"
Ok, that's about it for me today. I'm off to run a couple of errands - gotta stock up on some crafty items for the weekend and a project that I have in mind. Hope you all have a wonderfully creative weekend! I'll be seeing you soon. I hope you are on the mend now with your tooth saga! This is such a stunning card! I love the witch legs and all of the fun details and colors you used! This is so cute, Tanya! I am glad you're feeling better and even had some crafty time. Love all the distressed layers. Beautiful frame and the bow is just very cute. Great job! I love your cards. And I love that you do the insides also. Hope you continue to fill better. Tanya ~ So happy to hear your procedure wasn't too bad but make sure you REST! I TOTALLY get the drill in the ear thing ~ Eeeek! Well this card is AMAZING just like ALl your creations! This girl does have style and so do ALL your creations & you! LOVE everything about it and that bow ~ OMG! LOVE it!!! AWESOME as always!!! Love your card...I have that cut file and have yet to use it. Your bow/embellishment is just perfect. Love it!!! awesome. I love all the details on your card!! Fantastic!! Love the shabby chic!Fabulous card and love how you did your frame. Hope your mouth is settling,that's all the worst parts over now!Have a great weekend. 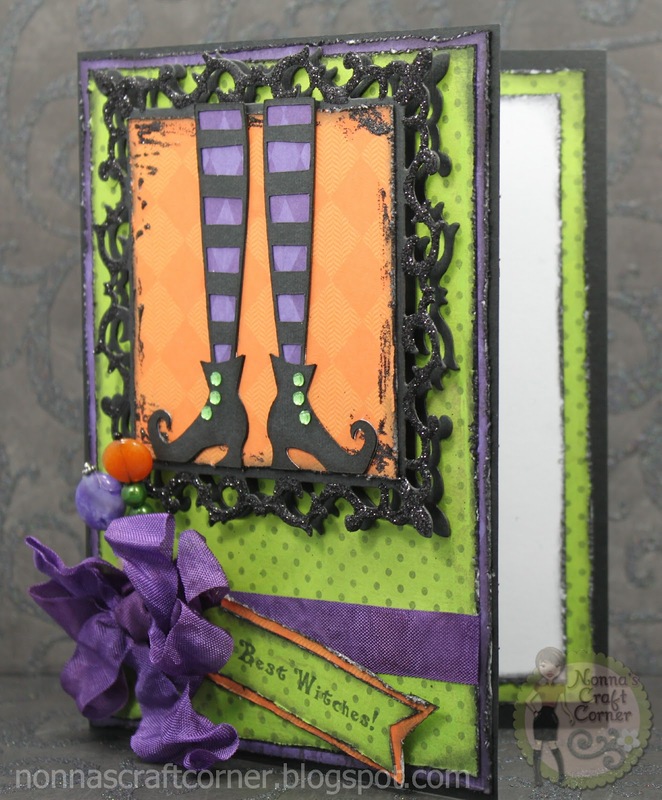 Your card is so SUPER cute, love those legs!! Love this card. The colors are great, the leggings fantatsic. Beautiful Cards Love the die cut you used. Glad your procedure went well. Really cute card. Love the black glitter and those stylish shoes. Have a great weekend. I love this! The mat looks amazing, love the glitter you added! So cute! Hope you heal up quickly & with no problems! Cute witch card; i love it! This is just TOO fun!! I absolutely love this card - the legs and shoes, the colours, gems, ribbon... all of it!! Fabulous job! I do hope that you continue to recover well! This is so much fun Tanya! I love that purple! So fun and bright! What a wonderful design!! This is so fabulous, Tanya!! I love the colors and those fun shoes!! Absolutely spook-tacukar! !